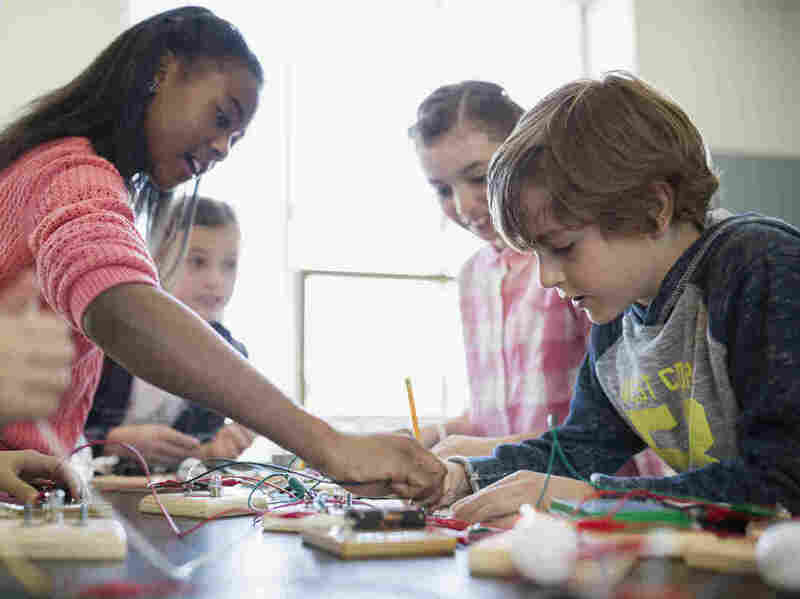 Science And STEM Education Are Critical To American Prosperity : 13.7: Cosmos And Culture We must unify America around the need for science and STEM education as the only guarantee for prosperity: Only education can keep America great, says astrophysicist Marcelo Gleiser. Growing up in a reasonably affluent family in Brazil, I have no doubt that my life changed forever when, as a 10-year-old, I watched the moon landing on live TV. How amazing was that? To see a human walking on the moon from the comfort of my uncle's bedroom in Rio? I was born two years after the Soviets launched Sputnik, an event that surely changed history as we know it, adding a new dimension to the Cold War. How many people looked up to the skies in awe, seeing that small, fast-moving dot of light, a man-made machine not much bigger than a beach ball inscribing its path away from Earth for the first time in history? National pride was hurt, and from a mix of fear of the Soviets controlling space and an intensely focused effort, the American space program took off to define the parameters of the space race. Now, a mere half a century later, we have launched machines to all planets of our solar system, exploring worlds that defy even the most creative of imaginations. Most Americans hardly understand the impact American science has worldwide. I don't mean just the technologies that everyone else on the globe (that can afford them) consumes or copies, or the might of its military. I mean the inspiration, in the minds of children, especially. People around the world watch the awesome movies, the TV shows, the NASA launches; they read the sci-fi books, the Marvel comics, the biographies of great scientists and inventors. How many Americans realize that one of the greatest, if not the greatest, legacies of this country are its amazing universities, incubators of some of the most creative ideas in the past 100 years? Ideas that have changed the world, that have shaped the way we live, that have saved (and taken) countless lives, that pave the way for what the future will be like. Manned missions to Mars, the privatization of the space race, self-driving cars, the explosion of social media platforms, renewable energy sources, the endless pursuit for new cures and vaccines, smart robots, ultrafast computers — these are the technologies that will define the 21st century, and they all depend crucially on science and scientific research. According to a report from the U.S. Patent and Trademark Office, from Jan. 1997 to Dec. 2015 the office granted 3,030,080 patents to U.S. entities, while the rest of the world combined was granted 2,709,771. Of these, 1,069,394 were given to Japanese entities. This trend is shifting now worldwide, with China taking a lead in the number of patent filings. There are many metrics to measure the impact of science in a country, and patents are only one. However, the trend is worrisome, as it shows a potential slowing down of American science. Patents relate to the creation and potential implementation of new ideas, some of which may be transformative. America's might is crucially dependent on its scientific base. This has been the history of this country, a country that developed the electric light, the airplane, the assembly line, the computer, the Apollo program, Microsoft, Apple, Google, Tesla. A huge amount of technologies we use every day — amounting to about 30 percent of the national GDP — depend on quantum physics in one way or another. Basic research that changed the world in unexpected ways. For America to remain a dominant player in the world for the remainder of this century, it should not revert to a past where its strength was based on the extraction and refinement of oil and gas, and on industries sustained by coal-burning plants. This is an old model of progress, one that will not lead to the long-term growth of the American economy. Once the cup is empty, and it will become empty, you either get thirsty or find something else to drink. Despite loud climate change deniers, people are increasingly aware of the need for alternative renewable energy sources. Even for those who for some reason or another challenge that global warming is caused by humans, cleaner air to breathe is never a bad thing. I imagine coal miners would agree with that. If change is needed, it is in the redirecting of the old model and on the retraining of workers that now depend so crucially on it. What will happen to the 3.5 million truck drivers in the U.S. when self-driving trucks take over the interstates? We need a national Marshall plan to reeducate workers on the technologies of the present and the future. We need to unify America around the need for science and STEM education as the only guarantee for prosperity. Only education can keep America great. There is a new race out there, the race for digital technology dominance. Whoever leads it will define the parameters of the global economy for the next decades. More oil and coal burning will only choke our children and kill our forests. A new reality is calling, and we need to respond to its call together.